“In the year since Trump’s inauguration, we have seen an outpouring of popular mobilization in resistance to his administration’s policies. Crowd estimates suggest that 5.2-9 million people took to the streets in the United States to protest Trump’s policies or points of view over the past year. Many more have mobilized worldwide in reaction to the rise of right-wing populist movements across the globe, using people power to contest entrenched authority and confront oppressive regimes and systems”. “Women have been at the forefront of these efforts. The 2017 Women’s March on Washington — whose Sister Marches spanned all 50 states and dozens of other countries — was likely the biggest single-day demonstration in recorded U.S. history. The momentum continued in 2018, with between 1,856,683 and 2,637,214 people marching in Women’s Marches this year. And women continue to be at the helm of movements like Black Lives Matter, the struggle for immigrant rights and the Fight for $15″. There is much to be gained through initiatives where women can convene to share knowledge, train, plan and develop solidarity networks for the struggles ahead. Creating women-led spaces that are informed by research helps build feminist momentum around the most pressing issues of our times. A Special Report from the United States Institute of Peace examines the influence of gender dynamics on women’s contributions to nonviolent movements, and how women capitalize on these dynamics to create special opportunities for participation and tactical innovation. The report is based on research and interviews, complemented by the author’s expertise in the intersection of gender and political instability. Research shows that sustainable peace is more likely if women are meaningfully involved. Women have historically been denied full access to political spaces usually reserved for or dominated by men. 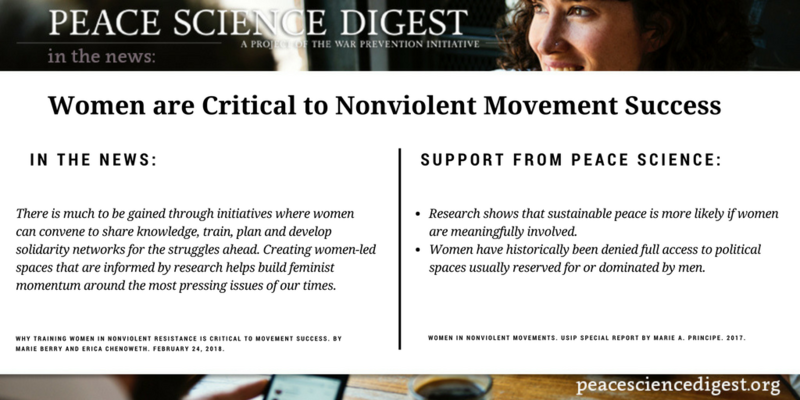 Why Training Women In Nonviolent Resistance Is Critical To Movement Success. By Marie Berry and Erica Chenoweth for Waging Nonviolence. February 24, 2018. Women In Nonviolent Movements. United States Institute of Peace Special Report By Marie A. Principe. 2017.